When learning English as a second language you really need a good teacher to teach you. You might have English class and a teacher who teaches you English but you need a teacher who should be always with you like a friend. Then an English dictionary can be a very good friend of yours. Without a good dictionary, learning English is extremely hard. In this article we recommend best English dictionaries for ESL learners which will help you to enhance and improve your English. Indeed learning vocabulary is the major part of learning English. Learning vocabulary starts from having a good dictionary, because whenever you come across a word which is new to you, you have to check the meaning, then a good dictionary can help you a lot. When you come across a new word observe four things of that: 1. Pronunciation, 2.Meaning 3. Spelling 4. Nature. The first step to learn new words is to listen to their correct pronunciation. You can use the following English dictionaries to enhance your English. If you have just started learning English and your English is not very good, then you need a good bilingual dictionary, because initially English to English may be too hard for you. Here we recommend Babylon can be one of the best English dictionaries for ESL learners which is good and quick bilingual dictionary. 1. It lets you to translate from any language to any language. 2. You can do full document translation. 3. Babylon integrates seamlessly into Microsoft Office spellers. 4. And Babylon is leading dictionary packs -Oxford, Britannica, Merriam-Webster and more…..
Oxford Essential Dictionary is one of the best English dictionaries for ESL learners, because it uses simple and basic words inside its definitions which are good for beginners. Oxford Essential Dictionary can be ideal for learners of English and/or school children. 1. Oxford Essential Dictionary gives all the essential help and information elementary and pre-intermediate learners need. 2. Oxford Essential Dictionary includes over 24,000 words, phrases, and meanings. 3 .2,000 of the most important words in English are marked as keywords, so students know which words to learn first. 4. Gives extra help with grammar, pronunciation, and spelling. 5. It includes picture Dictionary, exam preparation (KET) exercises, language games, a Speaking Dictionary, and NEW iGuide, an interactive tutorial to help students explore dictionary entries. Oxford Advanced Learner’s Dictionary is a wonderful dictionary. This is one of my favorite it’s good definitions and many example sentences. The difference between it and the Oxford Essential Dictionary is this that it has elaborated definition with idioms and phrasal verbs. On the other hand Oxford Essential Dictionary contains essential definition with most basic and common words of English. And this dictionary is for intermediate and advanced level learners. 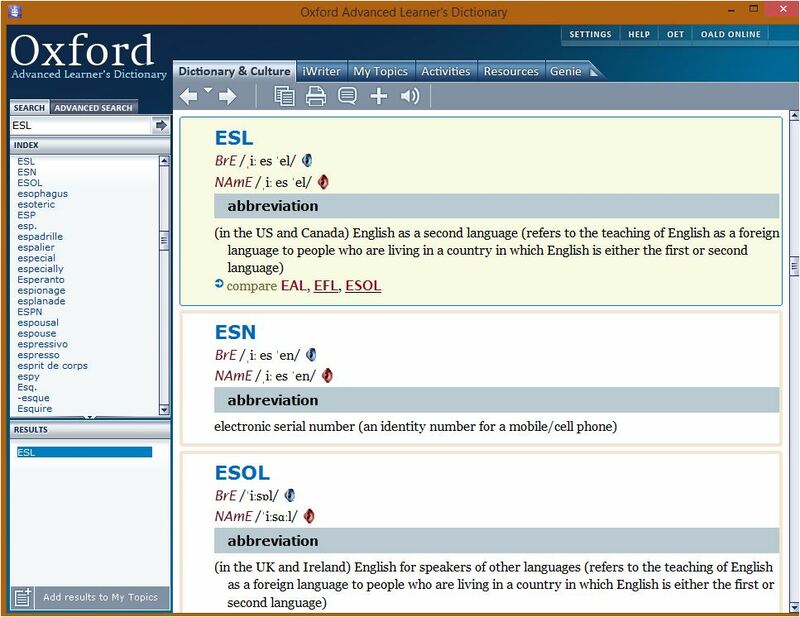 The Oxford Advanced learner’s Dictionary Online is free. 1. 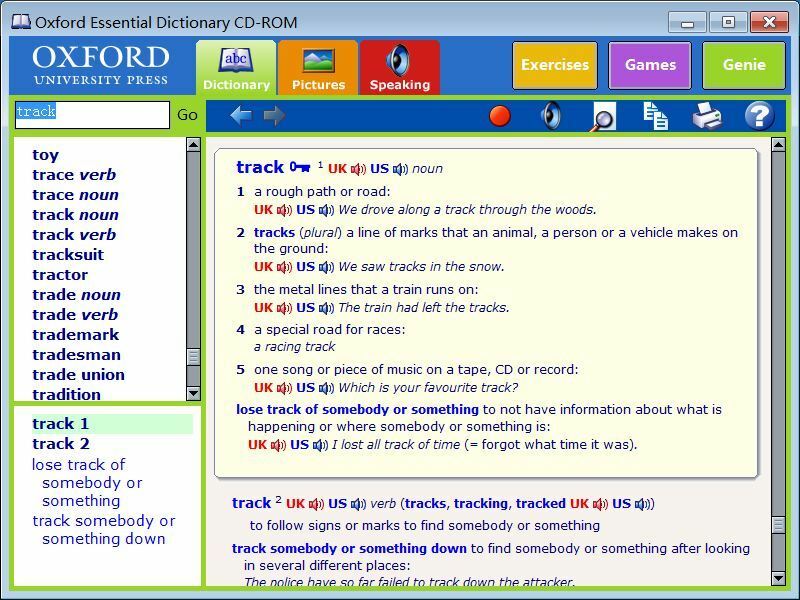 It is the world’s best -selling advanced learner’s dictionary, which can develop the students need for passing exams and communicating in English. 2. It has over 100 million users worldwide and is the world’s best-selling advanced learner’s dictionary. 3. The new 9th edition with Oxford iSpeaker and Oxford iWriter make OALD the ultimate speaking and writing tool. 4. It provides both British and American pronunciation which is useful for English learners. If you have good vocabulary power and comprehend higher level English vocabulary, we comprehend for you Cambridge Advanced Learner’s Dictionary. This dictionary has more details and additional data on every word. This dictionary is the best Britain dictionary for general Britain English, but also it has options of different languages you can search a Britain English word in American English. 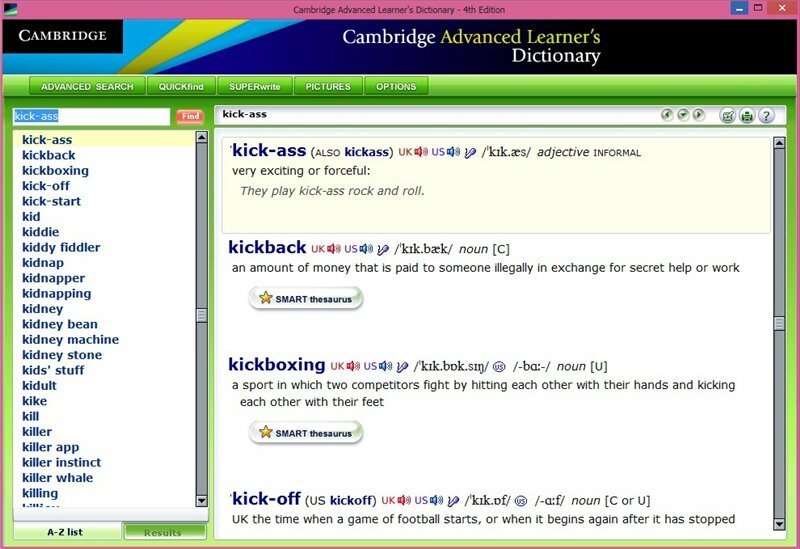 Cambridge Advanced Learner’s Dictionary online is free. 1. It has a simple search option and allows you to find the meaning of word. It has simple, clear and easy to understand definitions. 2. If you didn’t find what you were looking for the on the panel the similar words will be displayed. 3. You can also read teh sentences of the words you searched. So you can use them in real life too. 4. It has sound function which will teach you to pronounce the word you searched. Merriam-Webster’s Advanced Learner’s English Dictionary is big and extensive English dictionary. It is for advance learners and useful resources for teachers as learners of English. Merriam Webster’s Online Dictionary is free you can use it. 1. This dictionary provides in-depth and up-to-date coverage of basic English vocabulary. 2. It contains outstanding features nearly 100,00 words and phrase, more than 160,000 usage examples, more than 22,000 idioms. 3. Moreover it contains verbal collocations, and commonly used phrases, and more than 1,000 original drawings–including 16 pages of full color art. 4. Abundant supplemental information includes 25 pages of grammar. In this article we mentioned 5 best English dictionaries for ESL learners, if you have just started learning English and your vocabulary power is not good, we recommend you no to use Advanced level dictionaries, because it will hardly assist you, and is more likely to confuse you. 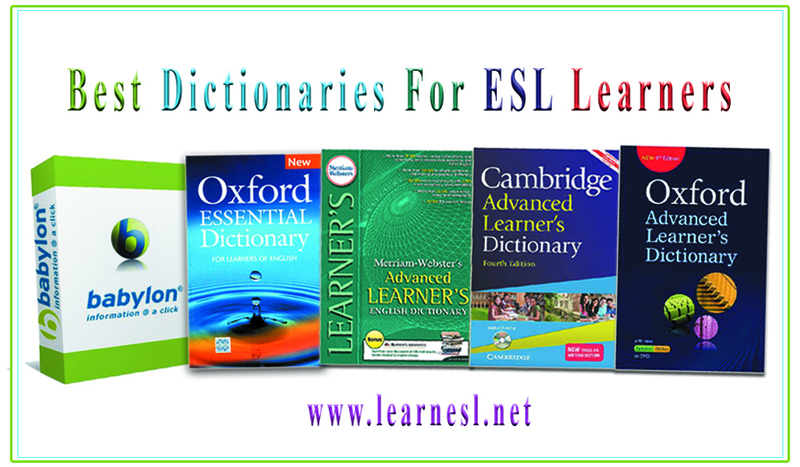 Moreover each of these dictionaries mentioned here can be downloaded for free from third parties. I am using Oxford Advanced dictionary and agree so satisfied with.